For the first time in the 50-year history of America’s pony car, the Mustang has traded in its solid axle for an independent rear suspension. 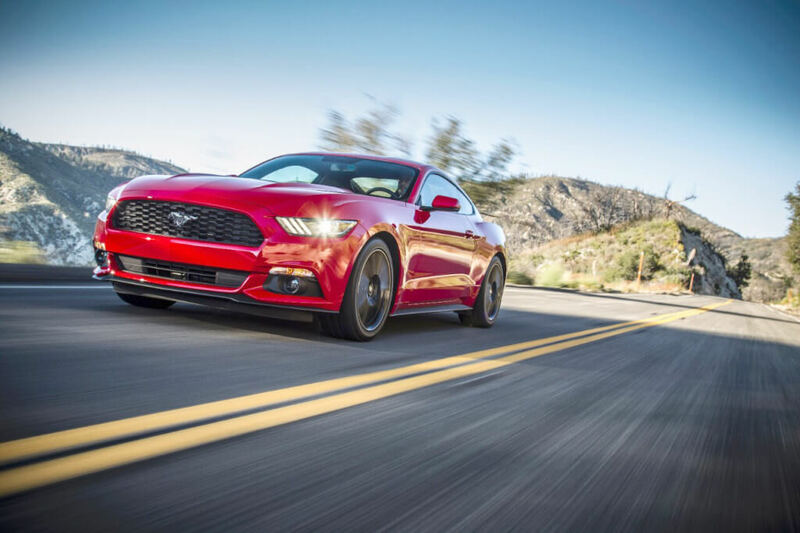 This major upgrade lets the Mustang reach new heights by providing much-improved handling and steering feel. Ford now offers Mustangs with a 2.3 Liter Ecoboost engine that produces 310 horsepower and 320 lb.-feet of torque, more power than the Mustang’s standard V-6, and does so while getting a jaw-dropping 25 m.p.g. combined. Push-button start. Paddle shifters. HID Headlights and LED taillights. A 28%-stronger steel body. And those are just the features that come standard. When you add heated and cooled leather seats, navigation, and pony-themed puddle lights, the new Mustang experience will leave you speechless. The redesigned Mustang is more muscle for your money than any vehicle on the market. Mustangs have always raised eyebrows with their performance on the road, but the new Mustang is the first to get drivers’ hearts pounding with its stunning interior. Refined and refitted, the Mustang now offers more room for drivers and passengers in addition to a standard of interior comfort normally only approached by European luxury brands. The redesigned Mustang offers four different driving modes to customize steering effort, throttle response, shift control, and stability control. The four modes, normal, snow-wet, sport, and track, also allow drivers to customize steering using standard, custom, and sport settings. The redesigned Mustang is the best muscle car in the history of Ford Motor Company, and that’s saying something. At Butler Ford, we are thrilled to be in the business of sharing the legacy that Ford is constantly building. If there was ever a time to get behind the wheel of a Mustang, it’s now.